Two American submarines and one British boat gathered near the North Pole in mid-March 2018 for one of the biggest Arctic undersea exercises in decades. ICEX 2018, the 27th in a series of roughly biennial exercises dating back to 1959, kicked off in early March, when aircraft from the Alaska Air National Guard and the Canadian air force began delivering supplies to an ice floe inside the Arctic Circle. The supplies allowed a military-civilian team to begin building Camp Skate. The camp boasted accommodations for around 50 people and the infrastructure for a wide range of civilian scientific experiments and military training events spanning five weeks. For the U.S. Navy, the exercise was an opportunity to prepare for Arctic warfare. “The primary objective of this year’s ICEX is to test new under-ice weapons systems and validate tactics for weapon employment,” said Ryan Dropek, a test director at Naval Undersea Warfare Center Division Newport in Rhode Island. On March 9, the U.S. Navy nuclear-powered attack submarines USS Connecticut and USS Hartford surfaced through three feet of ice near Camp Skate. The Royal Navy fleet submarine HMS Trenchant surfaced on March 14 to join the American boats. To punch through the ice, the submarines conduct what’s called an “Arctic blow,” venting ballast to rapidly boost buoyancy. With three submarines instead of the usual two, the 2018 exercise is the biggest in recent memory, and comes at a time of increasing competition for the rapidly-warming Arctic region and its shipping lanes, fisheries and mineral wealth. Climate change has thinned out year-round sea ice and put the region on track for nearly ice-free summers in coming years. But military interest in the Arctic isn’t new. During the Cold War, the world’s leading navies considered the North Pole to be a safe haven for submarines. In 1948, three conventionally-powered U.S. Navy submarines first explored the edges of the polar ice cap. For the mission, the U.S. Arctic Submarine Laboratory, based at Point Loma in California, installed a special sonar aboard USS Boarfish. Diesel-powered submarines require frequent surfacing, limiting their endurance for under-ice operations. Nuclear power allows for much longer voyages under the ice cap. In 1958, the nuclear-powered USS Nautilus made the first crossing of the Arctic Ocean beneath pack ice. In March 1959, USS Skate became the first submarine to surface through the Arctic ice. Skate and USS Seadragon conducted the first two-boat rendezvous at the North Pole in 1962. Shortly thereafter, the Arctic Submarine Laboratory modified one of its tests tanks, allowing researchers to freeze a layer of water on the surface in order to test reinforced submarine sails that are better suited for punching through ice. Many modern submarine designs feature these hardened sails. Naval interest in the Arctic peaked in the late 1980s. In 1986, USS Archerfish, USS Ray and USS Hawkbill completed the first three-boat North Pole rendezvous. A year later in 1987, HMS Superb, USS Billfish and USS Sea Devil converged on the Arctic for the first joint U.S.-British ICEX. Arctic exercises ebbed during the “peace dividend” of the 1990s and in the early years of the U.S.-led war on terror. Climate change and a resurgent Russia combined to make the Arctic “hot” again. ICEXs in 2011, 2014 and 2016 each involved two American submarines. ICEX 2018 echoed the more-intensive Arctic operations of the 1980s. While scientists studied the polar environment during ICEX 2018’s planned five-week duration, the crew of Connecticut and Hartford submerged for torpedo trials — marking a major departure from previous iterations of the exercise. The U.S. Navy immediately recovers any torpedoes it launches during training. In the Arctic, recovery poses a major challenge. “In 2016, divers tested and evaluated equipment which is being implemented for the torpedo recovery this year,” explained Lt. Courtney Callaghan, a U.S. Navy spokeswoman. 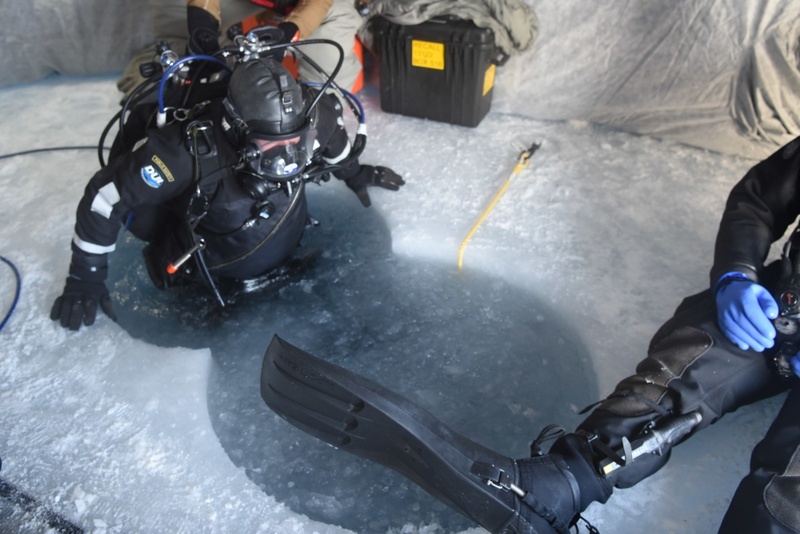 ICEX 2018 involved divers from the U.S. Navy and Coast Guard. After a submarine fired a torpedo, helicopters hauled divers and support crew to the area where the munition ran out of fuel. The team drilled holes in the ice for the divers, as well as a separate hole for the torpedo’s extraction. Divers then installed brackets and cables around the torpedo so that a helicopter could reel it out of the water. “There is a certain level of difficulty to complete a task on land,” said Builder 1st Class Khiaro Promise, another Navy diver at ICEX 2018. “To be able to go underwater and do the same thing such as cutting, welding and underwater demolition is such a unique challenge.” Especially under the polar ice cap. With climate change only accelerating and the Arctic becoming more accessible by the year, the intensity of ICEX 2018 could signal a new normal. The next ICEX should take place in 2020.